Achieve streak-free gloss on windows, mirrors and stainless steel with our NATUREHOME organic glass cleaner with vegetable alcohol. 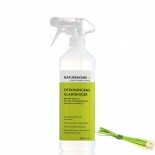 Thanks to the addition of essential organic lavender and lemon grass oil it leaves a comforting and refreshing scent. Without animal tests, made in Germany - the glass cleaner is vegan, meaning purely vegetable-based and 100% biodegradable.